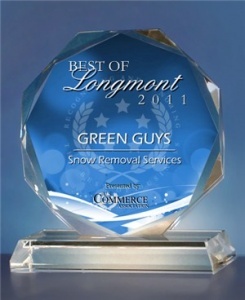 NEW YORK, NY, December 7, 2011 — GREEN GUYS has been selected for the 2011 Best of Longmont Award in the Snow Removal Services category by the U.S. Commerce Association (USCA). U.S. Commerce Association (USCA) is a New York City based organization funded by local businesses operating in towns, large and small, across America. The purpose of USCA is to promote local business through public relations, marketing and advertising. Meet the Newest Addition to the Green Guys Family! What Do Skiers and Gardeners Have in Common?